With the increase in number of cars, it was obvious that the number of accidents will also increase unless we follow traffic rules and maintain our vehicles well. A Maruti Dzire’s tyre burst while driving on the highway. Due to the speed, and the tyre burst, the car driver lost control. This send the car crash into the divider, and then take off from there and roll on to the other side of the road. This sent the car into a roll. After rolling on the road several times, the car finally came to a halt after hitting the center divider. On the other side of the road, a Royal Enfield rider was cruising at usual highway speed. This rolling Maruti Dzire comes into his path, and collides with him. 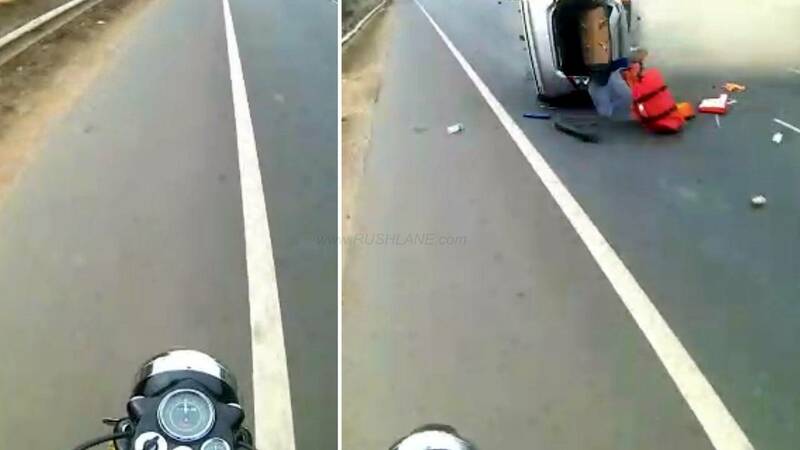 Luckily, the rider had enough time to reduce the speed of the bike, and also, the speed of the rolling Maruti car had also declined. Watch the video below to see what happened. As they say, When it's not your time to die, don't be not like those whose hearts are filled with fear of death. A very very close save for the Bullet Rider who is at no fault! Be Safe Guys! Luckily, everyone involved, survived the mishap. But, it is to be noted here that the number of accidents which are result of tyre burst, are on an increase at a massive pace. Recently, it was revealed that 40% of the accidents which took place on Yamuna Expressway, which is regarded as one of the best highway in the country are due to tyre burst, reveals a new Automotive Tyre Manufacturers Association (ATMA) and Indian Tyre Technical Advisory Committee (ITTAC) report. This particular mishap occured between Dankuni and Palsit on NH2 (Durgapur Expressway) in West Bengal. Same is the case with any other highway in India. In spite of driving safe, following traffic rules, there are accidents which are occurring due to tyre burst. The report adds that there are a large number of Indians who rely on heavily repaired / patched tyres. This is a huge no. You should replace such tyres at the earliest, says Rajiv Budhraja, director general of ATMA. Some are of the opinion that the reason for tyre burst is manufacturing defect. In reality, the cases where manufacturing defect is cause of tyre burst are rare. Majority or reasons behind tyre burst are not maintaining tyre pressure, using tyres beyond its age, and over-speeding. Every tyre comes with a speed limit. Standard limit for all tyres largely is 160 kmph. These tyres are coded S. The one’s coded H (high speed) can survive till 230 kmph, and those coded with V (very high speed) are for speeds above 230 kmph. India has one percent of the world total vehicular traffic and yet it accounts for almost 10% of world road accidents. Apart from improper use of infrastructure, human negligence too leads to such incidents. Road signs placed on Indian roads don’t help mitigate road disasters but increase potential road hazards. This is because they are placed in locations that instead of improving traffic woes only seem to worsen the situation. There are basically three types of road signs which include: advisory, cautionary and compulsory signs which need to be followed by individuals to lower accident rates. However, traffic infrastructure in India is in doldrums as these signs are placed in areas where they aren’t visible. Moreover, people love to ignore these traffic signs causing a series of events to unfold at a later stage. In order to improve traffic conditions in India the government and respective authorities need to integrate intelligent traffic systems, road safety management systems, improved road construction and relevant automotive technologies within existing infrastructure.